Learn how to be more sustainable and reduce your travel related carbon footprint. Air travel accounts for over 11% of UC San Diego’s total greenhouse gas emissions. To support the university’s Carbon Neutrality goals, IPPS encourages all staff, faculty, and students to adopt sustainable travel practices. Use this sustainable travel guide prior to booking and during your next trip. Book direct flights. Flying non-stop cuts down on half of a single flight’s emissions since you’re avoiding extra landings, takeoffs and taxi times. Use a Connexxus agency for complex or multi-leg trips. Full service agents are experts at identifying routes and airports that will work best for your trip, cutting down on extra travel time and expense. Fly Coach or Economy class. According to a study from the World Bank, the emissions associated with flying in business class are about 3x as great as flying in coach. In business class and first class, seats are bigger, so fewer people are being moved by the same amount of fuel. 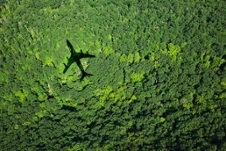 The study also estimates that a first-class seat could have a carbon footprint as much as 9x times as an economy seat! Don’t print your airline tickets, use an e-ticket. With over 50,000 passengers flying out of San Diego every day that’s thousands of single use pieces of paper being thrown away. Do your part and utilize digital e-tickets on your cell phone. Carpool with your colleagues. When traveling with others, carpool to reduce the amount of fuel and carbon emissions. Choose an appropriate-sized vehicle. If you’re not traveling with colleagues, consider a smaller vehicle. Rent an electric or fuel-efficient car. Many of our preferred car rental partners in Connexxus offer a Green Traveler Collection of vehicles. These vehicles offer customers significant fuel economy and lower emissions. Take a Lyft. All Lyft rides are now carbon neutral! Employees can expense rides with ease by selecting their preferred payment method for trips, routing business ride receipts directly to their work inbox, and switching easily between personal and professional rides. Take the train. Taking a train can reduce your CO2 travel emissions by as much as 90% compared to a plane. Connexxus offers an Amtrak option where booking business class makes business sense. Use public transportation and/or a bike share if possible. Using public transportation can further cut down on business travel expenses and can reduce your CO2 travel emissions. When available, take advantage of bike share programs. Check to see if your hotel offers free bike rentals. Use the airport shuttle service if your hotel offers it. Using a shuttle service is typically free and can further cut down on business travel expenses and CO2 emissions by not having to rent a car for your trip. Did we mention Lyft? Create a Lyft Business Profile with your @ucsd.edu email address. New activations receive $15 in personal ride credit! Switch to your @ucsd.edu business profile every time you take a Lyft to help drive support for university-sponsored programs & initiatives. Book hotels that are Green Seal or LEED certified. Hotels with these designations integrate environmental considerations into their business practices to decrease their carbon footprint. There are several easy ways to find LEED certified green hotels. All LEED certified hotels will display their certification on their website. You can look for its distinctive logo. Many of these sustainable hotels can be found in Connexxus. UC partner brand Marriott has a large selection of LEED certified hotels to choose from. Some hotels offer free bike rentals. Turn off all lights and the air conditioning/heater when not in the room. As you would at home, conserve as much energy as you can when you’re not occupying your hotel room. Hang your towels after use. Many hotels encourage guests to reuse towels to reduce energy and water use of washing towels after the first or second use. Try to avoid using the hotel’s laundry service. Many times, they wash guests’ clothes separately, even if there are only a few items to clean. Leave the “Do Not Disturb” sign on the door for the duration of your stay. This cuts down on chemical cleansing agents, electricity used in vacuuming, and the washing of bed linens. Choose a sustainable restaurant to eat at. There are several restaurants to choose from that care about the environment as much as we do at UCSD. Say no to the plastic bags and straws at restaurants. Plastic bags and straws account for a large percentage of plastic pollution in the environment due to their inability to be recycled. The US alone goes through over 500 million straws a day. That’s enough straws to fill 127 school buses! Pack a reusable water bottle and/or travel coffee mug. This will cut down on the amount of plastic water bottles and coffee cups that end up in the landfill. Most airports have water bottle refill stations you can use prior to boarding your flight. Pack a reusable takeout container and cutlery set. This will substantially cut down on the amount of waste you generate when ordering your food to go.